The vast majority of us know what it’s like to holiday aboard a cruise ship, but have you ever wondered what it would be like to work aboard one of your favourite liners. To give you an insight into the life of the crew members, we are asking a few cruise ship workers about their time working on the waves. For the first instalment of this series, we are chatting to Mel from Broke Girl Rich about her years spent working on a cruise ship. Hi Mel, could you firstly tell us which cruise ships you worked aboard? 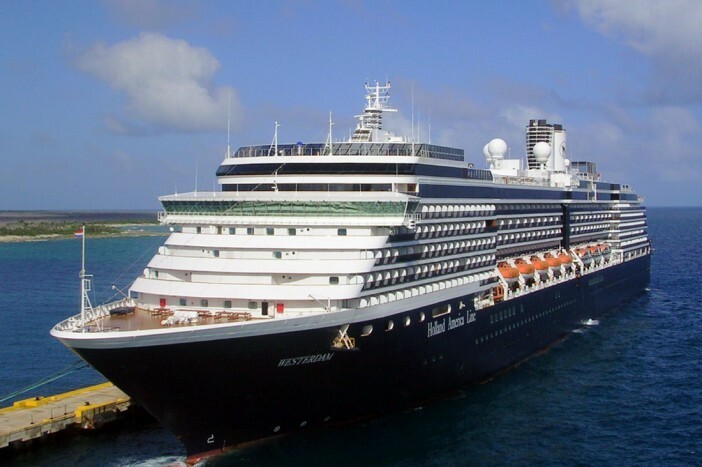 I worked for Holland America Line on most of their Vista and Signature class ships. What was your role(s) aboard the ships, and what did that entail? I was the Entertainment Technical Manager. I oversaw the scheduling for the technicians and cast for the Main Stage and the auxiliary performance areas. I managed the technical staff. I made sure all of the equipment on board was working or arranged for its repairs when it wasn’t. I made sure the shows were set up each night and then called all the production shows. I made sure the guest entertainers had everything they needed to perform. I oversaw the safety training for the technicians and cast. I also had a safety function on-board which changed from ship-to-ship – sometimes I was an assistant raft commander, sometimes a traffic director, sometimes a traffic director leader. What was your favourite aspect of working aboard a cruise ship? Cheap alcohol? Just kidding. It was definitely the traveling. I loved all the different countries I got to see. I also loved being out on the bow in the middle of the night in the middle of the ocean. On a clear night, the stars were just incredible. What’s the funniest thing that ever happened to you whilst working aboard a cruise ship? The funniest thing? I feel like with all the different cultures, that sometimes funny misunderstandings would occur there. A lot of my stage crew were Filipinos, and the first time they invited me to have dinner with them, I’d never really tried any Filipino food before. So they served a fish with its head still attached and I totally didn’t know what to do with it. Would you recommend working aboard a cruise ship? I think it’s a really awesome way to spend a year or two while you’re young. Do you still keep in contact with other crew members you worked with? That’s funny, I actually met up with an old rigging technician of mine this past week. We hadn’t seen each other in 5 years, but after a few minutes it felt like we’d seen each other last week. I do try to catch up with old ship friends whenever I’m in their town or they’re in mine, but we’re spread all over the globe now. When we do meet up though, it always seems like no time has passed. I think that’s just the type of friends you make on ships. Although Mel has hung up her crew uniform for a life on dry land, many of her compatriots still work day and night to ensure your cruise holidays are pleasurable and memorable. For a great selection of Cruise1st deals, please visit our homepage or call us today on 0808 274 6777.